Madhya Pradesh Secondary Education Board Bhopal (MP Board) is going to announce the results of 10th Class examination 2012 today on 4 June, 2012 sharply at 6.30PM on the official website of MP Secondary Education mpbse.nic.in. MP Board 10th Results 2012 will be declared today on the official website of MP Board mpbse.nic.in. Students who have appeared in the 10th Class Examination held between 3 March to 31 March, 2012, can check their MP Board 10th Results 2012 on the direct links given below. More than 8 Lac students have appeared in MP Board 10th Class Examination 2012. The wait is over and the MP Board 10th Results 2012 is going to be live on mpbse.nic.in website. Madhya Pradesh Board of Secondary Education will declare the results of MP Board 10th Class on 4 June, 2012 at 6.30 PM on the following website. 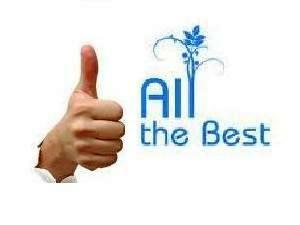 Wish you all the best for your good results.